This is their second summer, and I must have a more leisurely approach to the garden, for I've been keeping an appreciative eye on the Gazanias as they flower. The colours are beautiful - all sorts of combinations of orange, apricot, cream, and soft pink, joyous colours for a summer's day. And they seem to be in flower for weeks (in the sunny daytimes, when their petals open properly). I've even provided an edging of river stones for the blooms to rest on. Thoughtful! My friend plays around with pollinating and seed-raising, trying to get deliberate strains and colours. I've already collected seed from my plants - we'll see what they turn out like next spring. I know that Gazanias in the nursery are hybrids, so they'd be sterile. 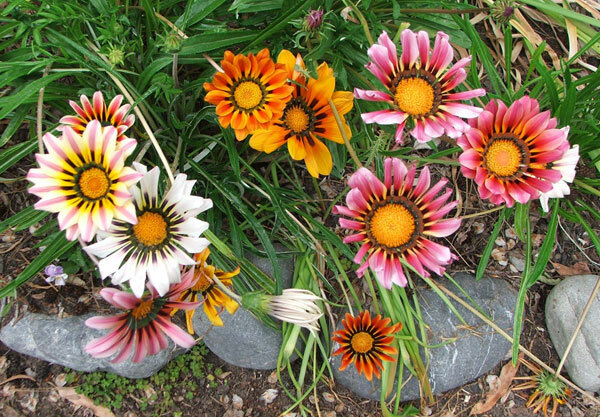 The Moosey Gazanias feature in my 2011 Moosey Flowers Calendar. Have a peep, but you'd better be quick - they're on April's page.